Dogs will go wild for these treats! The smoky aromatic flavor of sausage is sealed in every mouth-watering bite of Smoky Sausage Bites. 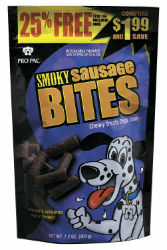 Your dog's senses will go wild when you open the bag and treat him to PRO PAC® Smoky Sausage Bites! Porcine Meal, Wheat Flour, Soy Flour, Sugar, Chicken Fat (preserved with mixed Tocopherols), Propylene Glycol, Rice Gluten, Chicken Meal, Natural Liquid Smoke Flavor, Phosphoric Acid, Salt, Garlic, Potassium Sorbate (a preservative), Added Color (Caramel, FD&C Red 40), BHA (a preservative).